Here at Atkins Home Improvements we understand the importance of the home; the home is where the heart is and our aim is to help you make a home you truly love. Everyone wants to feel comfortable and happy in their home, however, it often requires a bit of work to help achieve the ideal living space. This is where we come in; our skilled, friendly team with decades of experience in a wide range of construction trades is capable of undertaking any home improvement project delivering an immaculate finish with outstanding levels of customer service. From a large scale home renovation building your dream home to hanging a couple of your treasured pictures we will always go the extra mile to deliver the highest level of workmanship. In addition to the services we offer directly, we also work in close partnership with Angelina Wetherall Interior Design, utilising her expert opinion on design and styling. Offering an affordable online room design to traditional interior design services she has packages to fit any budget, starting from just £90. If you are looking to redecorate your home and need some help please check out Angelina Wetherall Interior Design or contact her directly on 07462751721. Inside or out give your flooring a spruce up or install something entirely new. From laminate and vinyl to real wood, carpet or tiling inside we’ll get the job done to the highest spec and with a trade account with one of the UK’s largest flooring distributors we can save you up to 20% on materials. Outside, whether its replacing paving slabs to creating a new patio or blockwork driveway no job is too big or small! Is your bathroom decor starting to look a bit dated? Maybe you’d like to fit a tile splash back to prevent oil marks in the kitchen? Whatever the need we’ll remove any old tiles, make good the walls and floor if necessary and fit your new ones with the nice level finish and crisp grout lines you were looking for. Theshold bars, tile edging and decorative mosaic trim will all be customised during the planning stage to give you a truly unique finish. Installing new doors and frames, skirting and creating customised wooden garage/warehouse racking forms part of our regular carpentry services, however, our bespoke fitted furniture really sets us apart from the crowd. Any space in your house can be converted into a fitted furniture storage area and we can supply and fit a wide range of different finishes, hidden lighting and internals customised to your requirements. A nice new kitchen worktop or change of the sink and toilet can dramatically improve the appearance of the kitchen or bathroom at an affordable price. From a small change to a complete renovation we’ll remove the old bits, plumb everything in and install your new units helping you to feel happier in your home! As a niche within this area we also regularly fit toilet hoses/douche sprays commonly used for cleanliness in Muslim or Asian households. Often painting and decorating can be a DIY job, however, if you want a truly professional finish it is worth giving us a call to see how we can help with your work. We’ll fill in and sand back gaps and cracks, render, skim walls and repair plasterwork if necessary, steam old wallpaper off and paint or wallpaper with precise crisp edges. Outside too we can help with restaining the fence or refreshing the paintwork on your fascia and soffit boards all at very competitive pricing. Extending your house or converting the loft or garage is a great way to improve the value of your house and enhance its functionality and with a wide range of larger construction projects in our portfolio we’ve got the skills to help you design and build your perfect extension. We can help with project planning and permission during the initial stages and then undertake the entire construction process required for the job. With your garden being an integral part of your home, it is surprising the difference a few simple changes can make. Water features, decorative stone and railway sleepers installed correctly look great, though you may fancy something larger like a a full returf, decking or installation of artifical grass. With a great portfolio to hang our hats from you can be sure we’re the right guys to the job and what beter to finish it off and enhance your security then a new section of fencing! Many odd jobs around the house could do with a trained professional to avoid potential DIY mishaps. Whatever the need, we’ll be happy to come and help with any job big or small and with our pricing starting from just £50 you can’t go wrong! Examples of work include; lock fitting, flat pack furniture assembly, wall mounting TV’s, picture hanging, light installation, concealing wires in the wall, installing light switches or sockets, fitting new taps, curtain rails and blinds, picture hanging and drain unblocking. Whether you know exactly what you’d like to do and simply want us to get the job done or you’d like us to project manage right from the design and planning stages we will be more than happy to assist. We operate from our base in Milton Keynes and have built our reputation on not only our workmanship and attention to detail but also customer relations; we will explain everything to you in full depth, making sure you feel in control of the work and understand any aspect you are unsure of; we won’t be happy until we are sure you are happy! 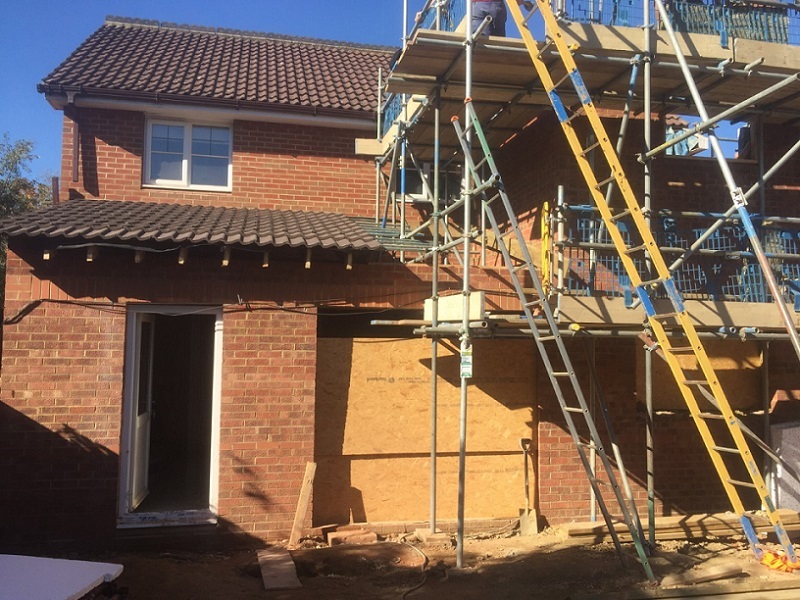 Home extension - A two storey rear extension to create a larger upstairs bedroom and massive downstairs open plan dining area and kitchen. 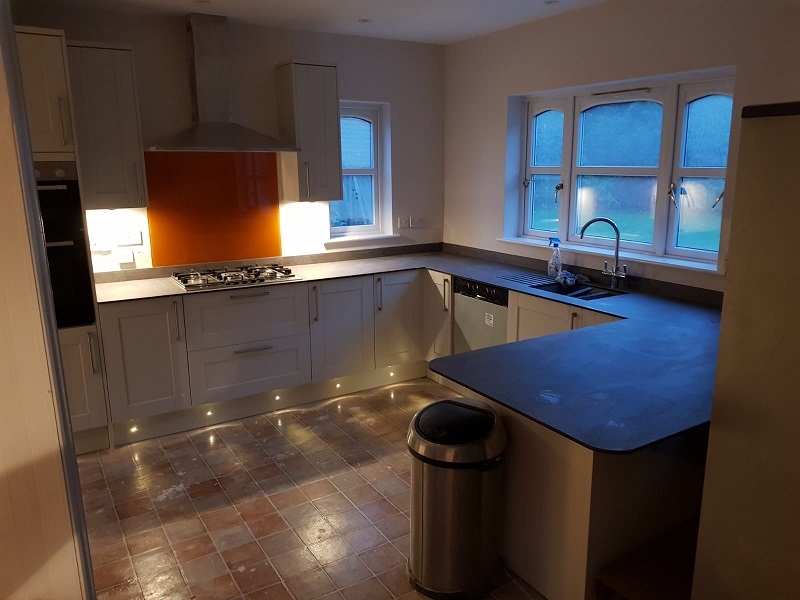 We started with the new foundations and brickwork, then extensive steelwork for the frame, extended part of the old roof and build the new section on ground level, fitted the kitchen and utility and decorated throughout. Internal design – We knocked through a load bearing wall, fitting an RSJ to enlarge the kitchen and create a communal dining areas. 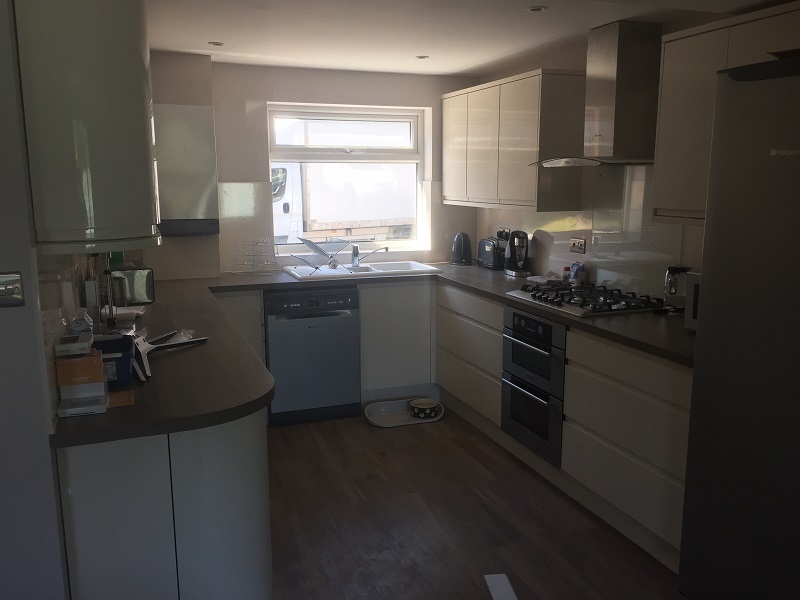 This build featured a new kitchen, plastering throughout, new plumbing for the gas hob and boiling water tap, we fitted new oak internal doors, removed the old airing cupboard and painted throughout. Bedsit creation - This shower room featuring a back to wall disabled WC, fully tiled walls, vinyl non-slip flooring and rainfall style shower enclosure with tiled alcove was part of a wider conversion of a large room into a bedsit. We partitioned the room to form a kitchenette/living area, bedroom and shower room, with aids for disability access installed where needed. Internal redesign – With this build near Milton Keynes, we knocked though an internal wall to open up the kitchen and living area, fitted a beam to support the ceiling, installed a new Howdens kitchen and a 3 zone underfloor heating system. The we laid luxury vinyl tiles before fitting new doors and skirting and painting throughout the downstairs. At Atkins Home Improvements we try to give the best service possible and will always go the extra mile to ensure your satisfaction. 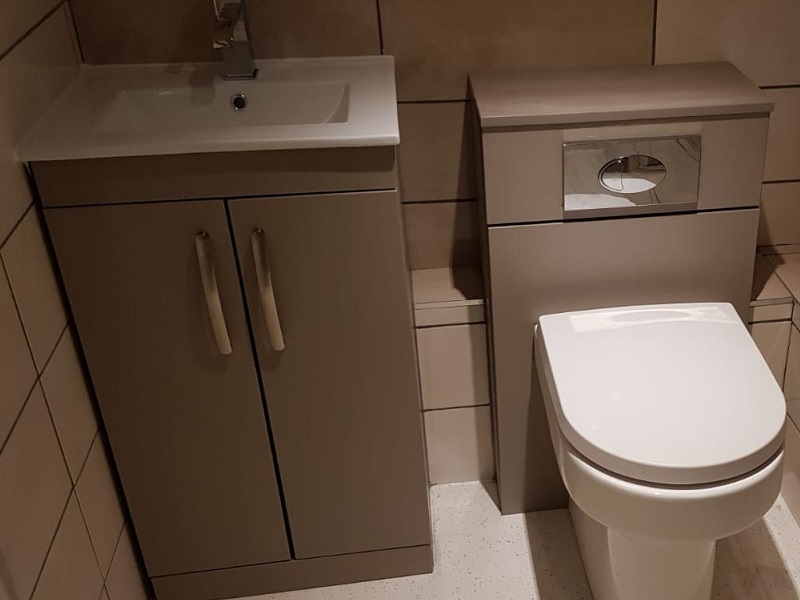 "Job was completed to a high standard, Zib kept us informed of the progress throughout and I am happy to recommend them"
"My bathroom has been finished to a high standard. I am so impressed with their politeness and understanding of what I wanted." "Excellent work. Completed within the time arranged. Great communication with Mr Atkins. Would highly recommend." " Zib's tilers turned up on time and completed an excellent job. Would definitely use them again!" again and recommending to others." "I cannot give these guys a high enough recommendation! Very high standards of work and at a great price, really happy." With decades of experience within our team of the home improvements industry we know how to transform your house into your dream home, at an affordable price! With decades of experience in our team across most trades, between us there is not much we haven’t dealt with before. You can be sure with us that your work will be completed by someone who takes pride in the quality of their work and knows what they are doing. Any home improvement project can throw up unexpected twists during a job, but should an issue arise or you decide that you’d prefer something different we’ll be ready with a steady hand and a bucketload of ideas to get things back on track the way you want it! Making a claim to be the cheapest around is often a way for unscrupulous workmen to pocket some quick cash at the expense of your home. Whilst we all want any job to be as cheap as possible, you do not want this to be at the expense of quality. We don’t make a claim that we are the cheapest around but you’ll find is that we charge an affordable price for top quality work backed up by our guarantee that if you are unhappy with any aspect of our workmanship we’ll go back and repeat it to your satisfaction. When you call or message us for a quote we will arrange a suitable time to come round and discuss the work. Measurements will be taken along with any input on your requirements, folllowing this we’ll get back to you within 24 hours with a full quote detailing labour costs (including an estimate of the time it will take) and then a breakdown of material costs according to the best value price we can find. The price will not change from this point unless you ask for more work to be done or change the specifications mid-job so you will be guaranteed no nasty surprises when it comes to paying the bill. We operate from our base in Milton Keynes and typically work within a twenty mile radius including Bedford, Northampton, Leighton Buzzard, Dunstable, Luton, Olney, Newport Pagnell, Heath and Reach and Buckingham. However, we are more than happy to work further afield if you need us to and as long as we can still provide a competitive quote! We work 7 days a week and can cover late nights when needed to fit around your work schedule and other commitments. Give us a call today and let us make your dream home a reality.